In April 2009, the Maersk Alabama, an American cargo ship containing among other things food aid for Somali people, was attacked in international waters near the African Horn by Somali pirates--natives of a fishermen’s village. At request of Captain Richard Phillips (Tom Hanks), the crew hid in the engine room and managed to wound two of the pirates, but in a dangerous twist of fate, Captain Phillips was taken hostage aboard a lifeboat with only the pirates for company. Quarreling among themselves, the pirates were surrounded by US Navy frigates which had to intervene to rescue Captain Phillips. Leave it to Tom Hanks to carry a movie like this on his shoulders. 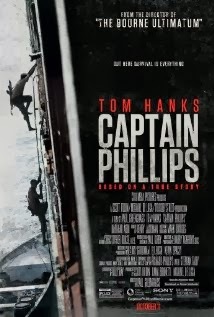 Captain Phillips is a taut thriller that keeps you on the edge of your seat virtually from the start and Tom Hanks shines the most, though Muse, the pirate Captain and his crew are excellent in their roles as well. The tension is palpable all along the film, among the crew in the Maersk Alabama-- when discussing the possibility of being attacked by pirates and possibly holding the fort, a union guy expresses that he isn’t paid enough to defend the cargo—and among the pirates because even though they agree on that thirty thousand dollars is too small a pay for their risk, they don’t agree on how to proceed, how to be led, and most importantly, how to treat their “ace card”. Captain Phillips is more effective because it’s a true story. This movie is a pure adrenaline ride from start to finish. Captain Phillips sounds like a movie my husband would really like. Thanks. I think it's great regardless of the genre of the audience...Not too graphic, and it's a true story.